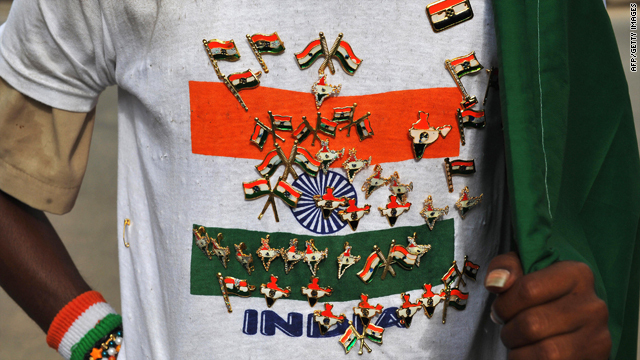 An Indian street vendor with badges pinned to his T-shirt sells Indian national flags to commuters on the eve of the country's Independence Day in Bangalore on August 14, 2009. New Delhi, India (CNN) -- Power will belong to the people of India, Mahatma Gandhi envisioned for his country, then ruled by the British. The words of India's independence leader echo as the country completes six decades as a republic. And Indians appear to agree that Gandhi's vision has not been achieved yet. A nation of 1 billion-plus, with more than 700 million voters, India faces a variety of insurgencies. Among them are Islamists, Maoists and the separatists of its northeast region. Asia's third-largest economy and one of the world's few growth markets now, the country supplies millions of food cards to enable its poorest to buy rice and wheat at subsidized prices. Indian authorities say one-third of the nation's population is illiterate and that about half of its women cannot read or write. "At 60, the republic of India is far from delivering empowerment evenly. Millions and millions of people find themselves on the margins one way or the other, whether economically, culturally or politically," said political commentator K.G. Suresh. He said Indians have limited options in choosing their leaders. "In many of our 28 states and at the national level, the leaderships are to a large extent identified by their families. Children seek to succeed their politician parents." India, which held its first general election in 1951-52 and the latest in 2009, is seen as South Asia's most successful democracy. Yet, the country's leadership acknowledges that Indian politics could use more talent. "There is a genuine concern that politics in our country is not attracting the best and the brightest among our people," Prime Minister Manmohan Singh said Monday, ahead of the country's diamond jubilee as a republic. He bemoaned that India's educated professionals and middle-income communities tend to avoid participating in the electoral process. In India, many boroughs report poor voter turnout and many candidates emerge winners despite serious allegations against them. Still, there was no consensus in the country's political establishment on course correction, Singh said. But the nation lists many accomplishments in a range of areas, such as telecom, space, information technology, civil nuclear energy, media, military and a soaring number of billionaires. In a decade, the country has emerged as a preferred outsourcing hub for international companies. Pummeled by the recession, many global companies now look to India as a low-cost production base. "India is brimming with hope. It's brimming with youth, who make up 60 percent of our population. We are very much on the path of success, though there may be some aberrations," said Shekhar Iyer, associate editor of The Hindustan Times newspaper. Indian President Pratibha Devisingh Patil began her nationally televised address ahead of Tuesday's Republic Day with Mahatma Gandhi's notion. She pointed to rampant corruption as a major hurdle in meeting goals. "A bottleneck and an impediment in bringing about the desired results, for which policies and schemes have been formulated and huge allocation of funds made, is weak implementation and corruption in the system," she said. India should fix accountability for programs caught in delays, Patil said. Yet, Indians are defiantly optimistic. "As a nation, I believe we have a very strong and collective commitment to overcome any challenge that the country faces, irrespective of minor distractions over disputes that get played up. As a nation, we have proved it time and time again," said Prasad Kunduri, a senior assistant editor with The Hindu daily.